Sackett Family Association members were saddened to hear from Jean Carpenter that her brother Mike Trickey had died on 31 December. Mike's other sister Katie Menon is also an Association member. 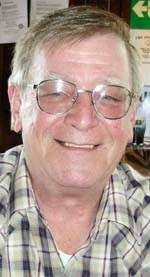 Mike joined the Association in 2008 at the same time as attending that year's reunion, in Thanet, Kent. It is a happy thought that he had taken that opportunity to visit the place where the Sackett story all began, and where his own Sackett ancestors could be traced back nearly 500 years. Those of us who met Mike at the reunion warmed to him at once. It was a pleasure to be in his company. He subsequently served on the Association Committee from 2010 to 2013. Mike served in the U.S. Air Force for 24 years, and more details on his military postings and subsequent career are online — see Life Legacy.